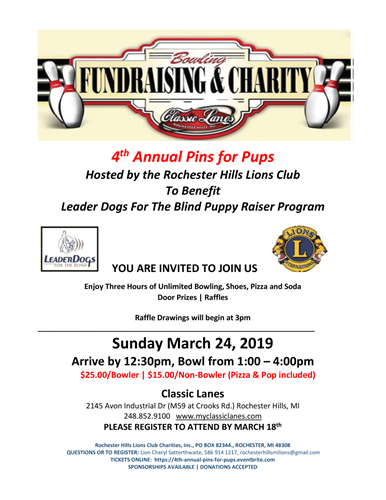 Join the Rochester Hills Lions Club for a fabulous fun event on Sunday, March 24th where we will raise money for the Leader Dogs for the Blind Puppy Raiser Program for the third year in a row. Enjoy three hours of unlimited bowling, which includes shoes, two slices of pizza and a soft drink for each guest. There will be door prizes and raffles throughout the afternoon. Guests of honor will include Oakland University’s Grizz, along with numerous Leader Dog puppies and their foster parents. During the Pins for Pups event, we will also be collecting gently used eye glasses and hearing aids if you would like to drop them off at that time. Sunday, 3/24/2019 Guests should arrive by 12:30 p.m., the bowling will begin at 1:00 p.m. and run until 4:00 p.m. Ticket prices are $25 per bowler and $15 per non-bowler.